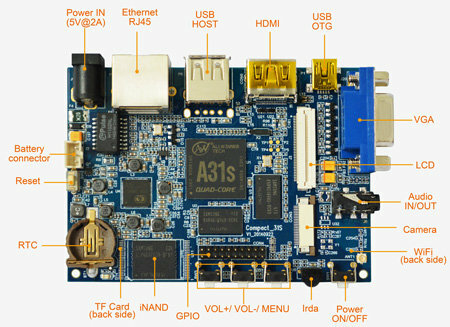 Boardcon Embedded Design, an ODM providing industrial Computer-on-Module, and board, announced Compact A31S powered by Allwinner A31s quad core Cortex A7 processor, with 2GB RAM, 4GB eMMC, HDMI, LCD and VGA video outputs, and various other ports. The company provides an Android 4.2.2/4.4 SDK with uboot 2011.09, Linux 3.3, various drivers, gcc toolchain, as well as the tools for development including SecureCRT.exe, Ubuntu 12.04-64bit (VM? ), and PhoenixSuit. Boardcon did not reply to my email request for availability and pricing information. More details may be found on Broadcon Compact A31S product page. I really like these kind of boards. I’d assume most tablet boards have a MIPI interface, or do you need some extra features not found in tablet boards? They are LVDS, if want connect a small size HD screen must use MIPI interface. As I have seen only MTK boards have this. They are nerf-ed in a lot of Dev boards as to avoid ISP licensing, which is absurd at this point. To Javi, so far, We Boardcon has no boards has a MIPI Interface, but MIPI interface is future tender, as now most big siz LCD are using MIPI interface. Yeah faster than RPi v2 (900MHz quad-core ARM Cortex-A7) and has RTC, but more pricey. To me the Linux support is crucial. Also do you see the SATA interface made A10 so interesting ?